It’s cute. Pale blue, with a stripped-down industrial-chic interior, a colourful mural, wooden benches in shades of brown and pastels. I first came across it in a review in Good Food magazine, which praised it for its authenticity, the punch of all things spicy and fermented, the use of ingredients like ant eggs and bugs, which may put off some eaters. To me, it’s just one of my favourite places in London. The name is Lao Café and the cuisine is Laotian, which is a word I can genuinely never pronounce. 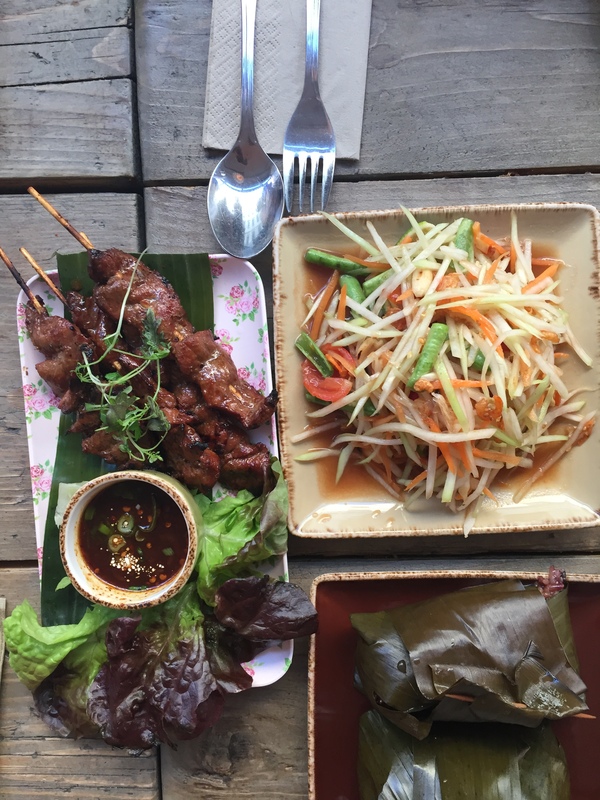 Think Thai, but somehow even punchier; there are papaya salads, crispy rice salads, grilled meat skewers. Salt-baked or deep fried whole fish that look like prehistoric creatures. Sticky rice wrapped in banana leaves. And yes, if you wish, you can have some ant eggs on your curry. I’ve been to Lao Café in all seasons. 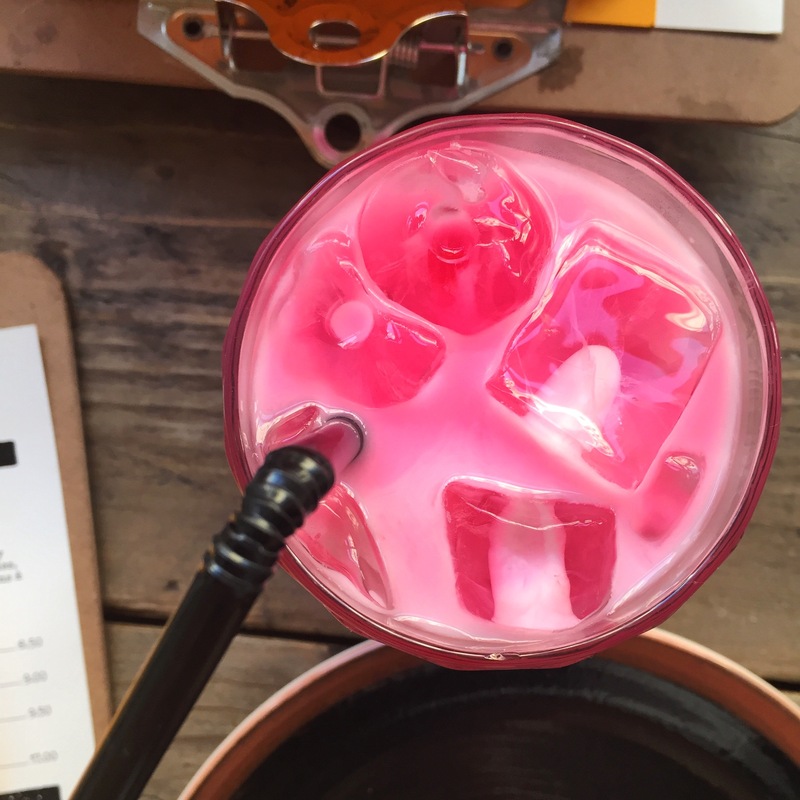 I’ve sipped on brightly hued, sickly sweet pink ice tea during a heatwave; lost all feeling in my mouth after ordering a salted egg salad “medium hot”; ladled warm, cloudy sour soup in a tiny china bowl while the last of the London snow was slowly turning muddy and brown. Because it’s a cuisine that’s designed for sharing, it’s perfect for a small group of people. 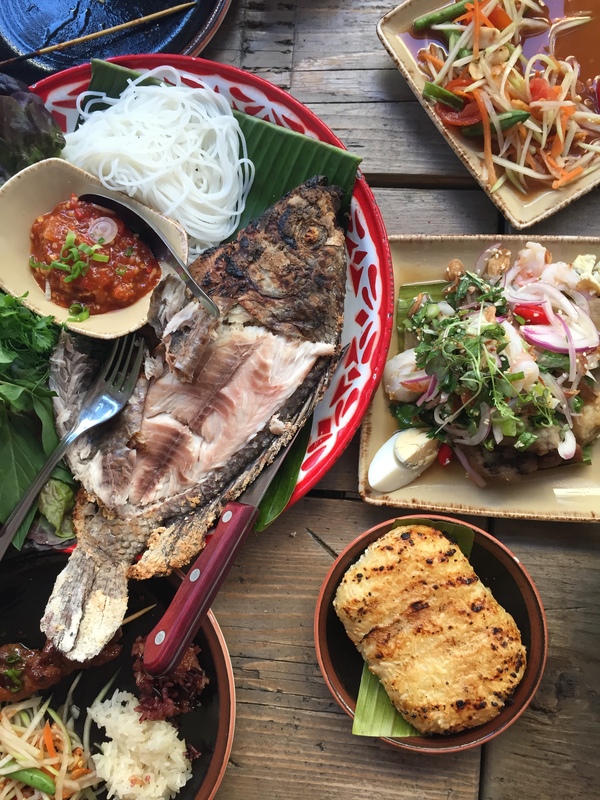 Parts of the menu changes regularly, but if you can get salt-baked fish, order it: wonderfully delicate steamed flesh, with an addictive fermented aubergine sauce and white vermicelli to accompany it. 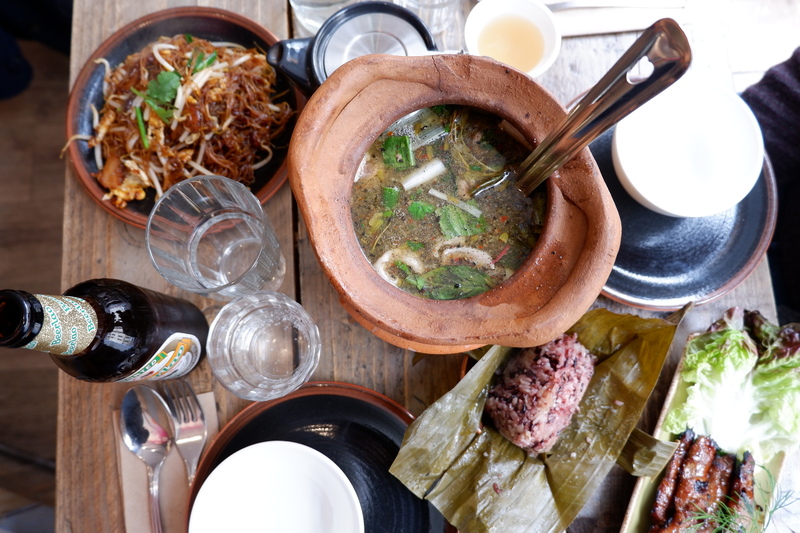 The salads, tart with lime, sweet with palm sugar and savoury with fish sauce, come with a variety of accompaniments and are light and hearty, satisfying and fresh at the same time. While I have loved almost every item I have ever had, I have favourites. 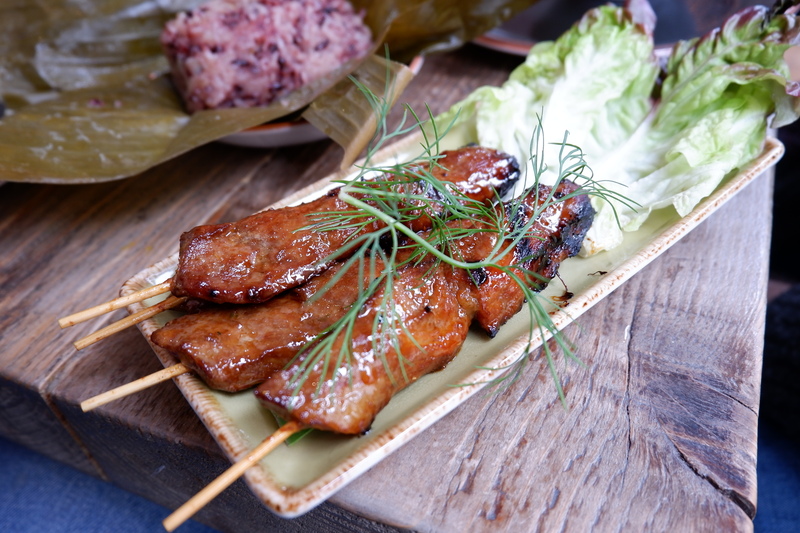 The simple, yet ingenious pork skewers, so savoury their flavour is reminiscent of Italian sausage, tender under a caramelised exterior; and the stir fried noodles, a generous pile of thin and sticky rice noodles with chunks of fried eggs and slivers of grilled pork, of which I could eat entire plates to myself. On a recent visit, the offer of a pot of soup was too enticing to pass. The hot pot comes to the table in a very theatrical clay pot, to be carefully ladled into delicate china bowls. We went for chicken and black sesame and it was rustic, cloudy, chock-full of aromatics, with fat collecting in droplets on the surface. A savoury, sour, just-spicy liquor with bits of meat you had to work for, bones and all, so nourishing and warming it put us in a sleepy daze. If you, like me, believe that ice cream is the only appropriate way to end a meal, they have homemade ice cream in three flavours: coconut, matcha and Thai milk tea. I have of course never attempted to order anything but Thai milk tea because where else can you get it? It has a subtle roast flavour from the tea, and it’s as creamy and sweet as, well, Thai milk tea. 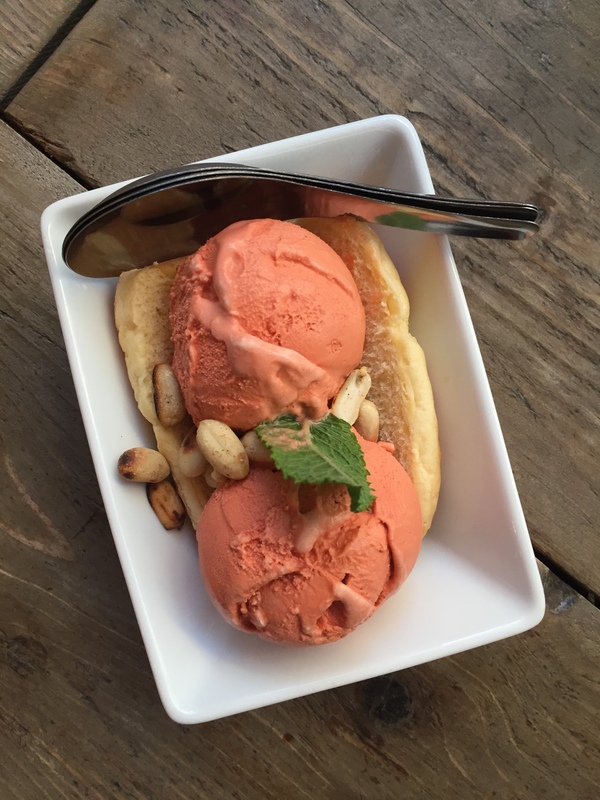 If you have inadvertently asked for any of your dishes to be spicy, despite the alarmed look of the waitress who probably warned you that it would be “Thai spicy, not English spicy”, the ice cream will be all the more welcome.